The debate on the staffing of South Africa's health care system is old, and the issues have changed very little over the past 30 years. It may seem incredible that, with so much debate over such a protracted period, there's so little improvement in human resources for health in the country. What more can one add to the discussion than to lament our collective failure? Why is it that other developing countries with far lower per capita GDP have such radically better indicators of health? 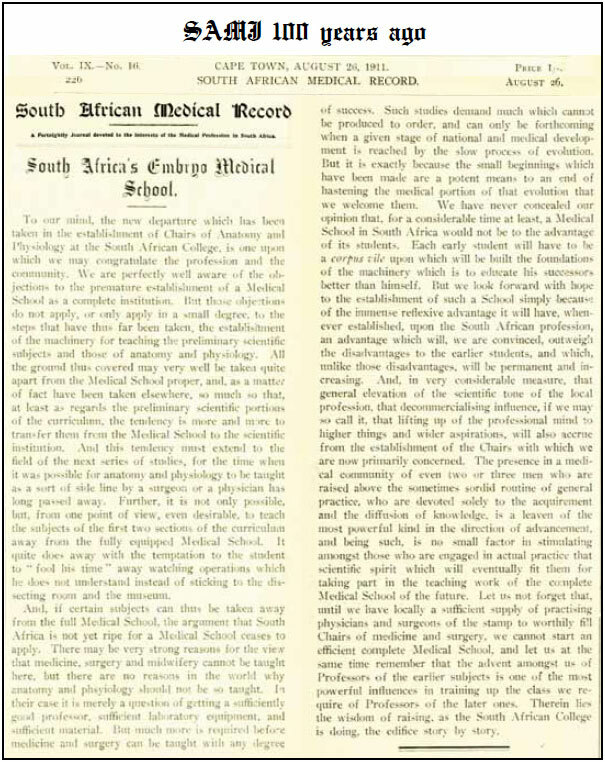 The Reynders Committee1 in 1980 reported to the Regional Health Organisation for Southern Africa (RHOSA) (members: Gazankulu, Lebowa, Kangwane, KwaNdebele, QwaQwa, Transkei, Bophuthatswana, Venda, Ciskei, SWA/Namibia) the difficulties being experienced by the members in recruiting doctors and other health professionals and in keeping them, once recruited. Of the 16 reasons documented for these difficulties, plus a further 3 for nurses, only 2 have been addressed, and 1 has fallen away with the end of military conscription. The Browne Commission,2 appointed in 1980 and concluded in 1986, found that there was 'excessive fragmentation of control over health services and a lack of policy direction, resulting in a misallocation of resources, duplication of services and poor communication between the various tiers.' Regarding personnel, the commission reported on maldistribution, dominance by whites, large percentages of qualified nurses not actively nursing, student nurse numbers declining, overworked staff and inaccurate manpower statistics. There is apparently poor conversion of recommendations into action. Perhaps the starting point in the debate is a failure to fully appreciate that South Africa is a developing country with a subset of developed communities - and not a developed country. Professionals, policy makers and legislators by and large live in the developed subset and exhibit an overwhelmingly unrealistic view of 'need'. This is pervasive in society and partly to blame for service delivery protests. It is time for professionals to accept that the country cannot afford all of the professionals that we 'need', based on the frequently quoted developed world benchmarks. The human resource for health (HRH) model for South Africa needs not only realistic thinking but also highly pro-active implementation. The country needs deliberate and aggressive development of task-shifting, task-sharing, introduction of other categories of personnel, focus on prevention programmes, and real care at clinic level - as opposed to the esoteric debates that we still hear about primary health care. As far back as 1986, the Browne Commission recommended that 'nobody should do a job that a person with a lower qualification could do equally well'. So in planning the 'doctor requirements' for the future, there is a need to recognise a more diverse set of professionals than doctors alone. Likewise, planning the range of specialties and the numbers of specialists should match the population and burden of disease variables. Human Resource for Health planning also depends on the availability of supporting infrastructure (theatres, hospitals, etc.) and all staff required to support the team. There have been attempts in the national Department of Health to design appropriate models3 that consider these many variables, but there has never been consultation and joint problem-solving with professional associations who are best placed to understand the issues. The conclusions of departmental modelling, and of work done by the Colleges of Medicine4, point to a deficiency in graduate numbers and, by implication, in training opportunities. Yet there are still 8 health sciences faculties, and their collective output has not grown to even keep pace with population growth. 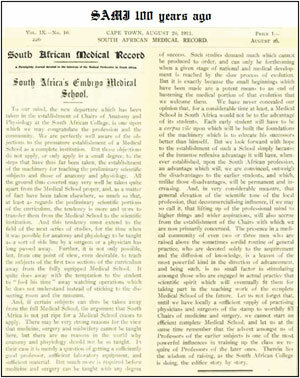 Already in 1984, the de Villiers Report5 presented recommendations for investigating the possibility of further facilities for medical and dental training. This committee also recommended that professional councils should give urgent attention to recruitment, training, salary structures and status of nurses and supplementary health personnel. The same problems continue to plague the health system today. There has not been systematic and prolonged, deliberate policy evolution and implementation, even for the public service. It is neither necessary nor advisable to embark on massive policy upheaval all at once, but a multi-year policy roll-out is essential. Some elements of a potential policy have been implemented. In the public sector, which is the foundation for training centralised intern placement, community service and occupational specific dispensation (OSD) have been implemented, mostly not well. However, other elements have not been implemented or have been very poorly managed, and opportunities missed. Policy on foreign recruitment is dogmatic and retrogressive,6 OSD failed to differentiate rural (and other inhospitable) settings from urban and, in fact, area allowances have disappeared. Failure to provide sufficient accommodation plus the policy on 'market-related rental' of official housing in isolated rural areas has a negative effect on the ability to recruit and retain professionals. Only very recently have registrar numbers increased, but without sufficiently understanding specialist needs. The CMSA has done considerable work on this matter. Lastly, the debate continues as to whether the private sector negatively influences the availability of public skills capacity. In raw numbers, this has not been convincingly proved. However, if interns and community service and registrar doctors are removed from the public sector figures, it is clear that experienced and skilled practitioners are more abundant in the private sector. Policy and action on collaboration of the sectors lacks creativity and remains clouded by suspicion on both sides. The cause of the human resource deficiency is frequently stated as financial shortage. However, it is difficult to make this case. Following the dawn of the democratic era in 1994 health services suffered major structural adjustment and budgeting challenges together with a shift to fiscal federalism. The Health Minister and national Department of Health have no control at all over health budgets. These are determined at provincial level from 'provincial equitable shares' distributed by an act of parliament annually on the advice of National Treasury.7 Salaries and benefits are negotiated centrally and prescribed for the entire public sector by the Department of Public Service and Administration after conclusion of Bargaining Chamber agreements. In an attempt to protect tertiary care and professional teaching and training (and other special health sector needs), National Treasury proposed several 'conditional grants'. The 'tertiary services grant' (TSG) and 'health professionals teaching and training grant' (HPTDG) were implemented for this reason. However, more than a decade later, there is still debate over, and individual provincial interpretation of, both grants. No province can report on spending of either grant or on compliance with any condition. Academics, together with the education authorities, concerned by the failure of the grants to protect teaching and training, have motivated to National Treasury to introduce a further grant in the education vote. The bottom line, however, remains that facilities, other infrastructure and equipment, while essential to health services, cannot replace a competent, appropriately skilled and motivated workforce. A comprehensive long-term human resource plan, managed with transparency and inclusiveness, is long overdue and a sine qua non for a successful national health service.